Today I’m excited to be participating in World Nutella Day for the first time! Thanks to Sara & Michelle, February 5 is the day to celebrate a love of all things Nutella. I don’t remember ever having had Nutella until a few years ago, but I’m so glad to have finally discovered it. You can spread it on toast, bake with it, or even eat it straight from the jar with a spoon – it’s delicious in every instance! 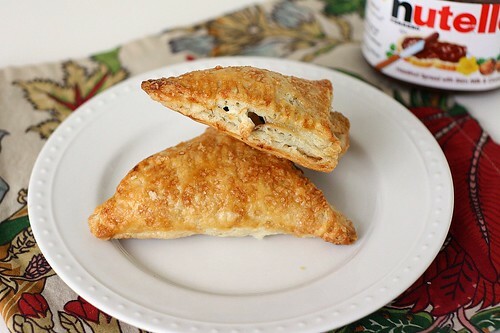 There are a world of Nutella recipes collected over on Nutella Day’s site and I considered many of them for today’s post but in the end, something else caught my eye – a unique twist on turnovers created by Jenny over on Picky Palate. She used puff pastry, Nutella and marshmallows to bake a simple, yet decadent treat and I knew there was very little chance that combining those ingredients could result in anything but a yummy snack. I can never leave well enough alone, so I complicated the recipe a little by making my own puff pastry instead of using a store-bought version. Next week I’ll show you exactly how I made the puff pastry but for today we’re just going to focus on the turnovers. They start with a square of puff pastry. A dollop of Nutella is spread in the center (15 seconds or so in the microwave makes the Nutella easier to spread) and then topped with a few mini marshmallows. To finish the turnover, fold the puff pastry over and crimp the edges with a fork – it’s as simple as that. Some of my turnovers popped open in the oven, but regardless of the way they looked, they were all delicious! The marshmallows almost melt in the oven so you’re just left with a gooey, Nutella-flavored filling in the buttery, flaky puff pastry. The turnovers were equally yummy warm from the oven and at room temperature. You could probably even prep them ahead of time, pop them in the freezer and bake them off at your convenience. Jenny has detailed instructions on her site so head over there to find those, as well as some great photos! 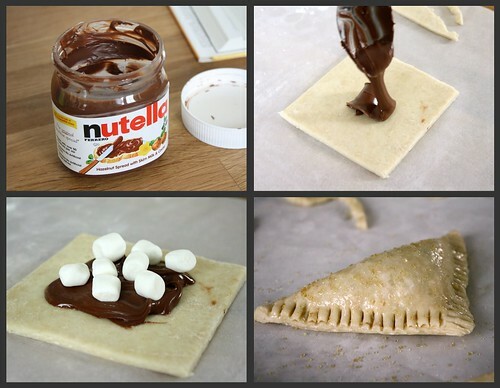 28 Responses to "Nutella Marshmallow Turnovers for World Nutella Day"
mmm these look amazing. A friend of mine made something similar though I’d like to make a guess that yours turned out far better than his. Happy World Nutella day to you and thanks for sharing! Shane did a great job as a hand model! 😉 I’m looking forward to your puff pastry recipe, it’s one thing I haven’t braved yet. My guilty pleasure: Eating nutella with a spoon while the kids are off playing upstairs and can’t seem do it! Oh my gosh those look good–and sooooo impressed that you made your own puff pastry! Homemade puff pastry! These had to be amazing! I was a huge fan of these, thanks for making them! I am somewhat new to Nutella as well. I’ve never used it in a turnover before, but it looks fantastic! What beautiful hands you have, Shane!! Ha Ha. These look amazing, except I have no idea what Nutella tastes like? Is it like a creamy fudge? I see it all the time around the blog world, but I have never tried it. @Jenn – Nutella is a chocolate hazelnut spread. Its consistency is similar to that of peanut butter. Hope you get a chance to give it a try! These look ahhhh-mazing!!! I missed Nutella Day, so I’m going to be celebrating a day late! I am so glad that my husband doesn’t read food blogs, because he’d be bugging me to make these right away! 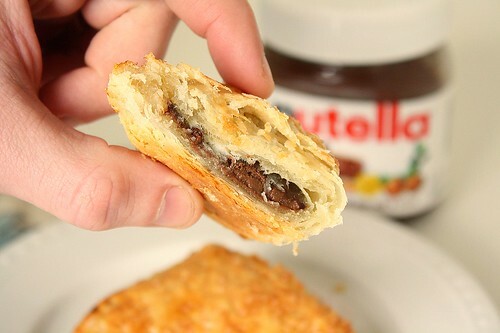 Nutella plus puff pastry sounds delectable. Watch out if Shane starts going for manicures. He might turn pro! WOAH!!!!!!!! I’ve never thought of Nutella and marshmallow before, but it totally makes sense! 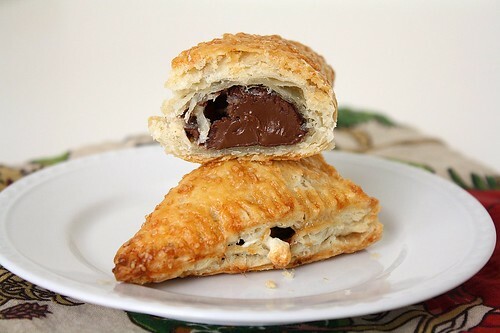 These turnovers make me want nutella s’mores! I am not a nutella fan, but have an intence want to try this…the marshmallow puts me over the top – improved smore! Wow….beautiful job on these. They look so good. Oh my goodness! Delicious idea! Oh wow! I am drooling!!! I really don’t know what to say. ok, so these look amazing, but i didn’t have puff pastry or the desire to make any. i lightly fried a tortilla in butter until puffy, spread nutella on it, placed a cut in half giant marshmallow on it and broiled on low for 2 minutes. fold over and wait 1 minute to cool. delicious! How long do you cook it for and at what temp?? @ash – If you click over to Jenny’s site (linked at the bottom of my post), she has instructions for baking these turnovers. I just wanted to ask if the marshmallows don’t change the taste of nutella anyhow?